Hailey Messenger, a member of Phi Sigma Sigma, recites a chant during bid day in Kogan Plaza Tuesday evening. Ear ringing cheers and chants could be heard throughout Kogan Plaza Tuesday evening as Panhellenic sororities welcomed their new members on bid day. 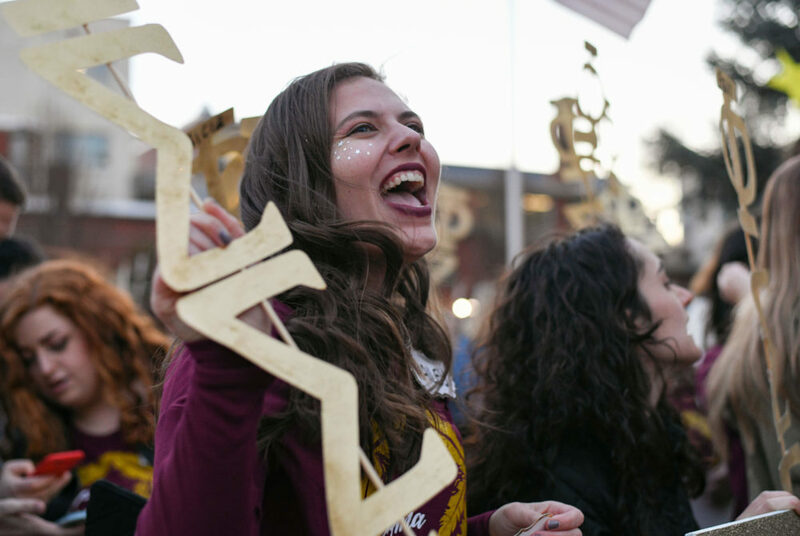 After a weekend of rush activities, new members raced toward their chapters as hundreds of sorority women celebrated the end of the first-ever deferred recruitment. Sisters held colorful posters and decked themselves out in matching outfits as they chanted their chapters’ songs. Bid day was held in Kogan after the government shutdown restricted access to the National Mall, where the celebration is usually held. Jordann Smith-Kingston, a junior and member of Alpha Phi, said that even though the day’s festivities were held in Kogan as opposed to the National Mall, the energy of the group matched that of previous years. She said Alpha Phi offered about 50 bids. This was the first semester of deferred recruitment, a policy that officials announced in spring 2016. Following the change, Greek life leaders held a series of new member trainings to keep freshmen engaged in Panhellenic Association and Interfraternity Council events prior to official recruitment. Chelsea Bendelow, a junior and member of Kappa Delta, said her sorority handed out 44 bids. Since recruitment was deferred this year, she said members were anxiously awaiting this day. Jackie Clarke, a freshman who accepted a bid from Kappa Delta, said although the experience was tiring, she would have regretted not going through the recruitment process. She said she landed in the right chapter with people she felt a connection to. “I met a lot of new people, talked to a bunch of different sisters from different sororities and that was an awesome experience in itself, so I’m really happy I got that,” Clarke said.